The Drum Major Society supports scholarship opportunities for students to participate in local/regional/collegiate training programs as well as some monetary support for similar endeavors. With personal friend Julie Benken’s passing in January 2007, her parents had a strong desire to preserve her passion and pride for bands. This dream continues to grow into fruitful endeavors that support Julie’s mission and spirit. 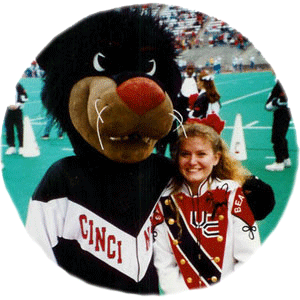 Julie marched during her Sophomore year with band playing clarinet, before she was able to fulfill a lifelong dream to become a college drum major in her Junior year at the University of Cincinnati. Julie was one of her college drum majors for 3 years. She was extremely proud to be one of the band’s drum majors. She was full of energy and enthusiasm in her work with the bands, and even after graduation she continued to work with the bands as a staff member. She always made friends, with active, alumni members of the band, and high schools throughout the area. Just days before her 34th birthday, she lost her battle to cancer. The last 15 years of her life we shared her with her second family, her college band. She had Moxie, especially during her last 3 years of life. She continued to work full time, attending band rehearsals, going to football and basketball games, and all of her college band concerts. These are the attributes Julie possessed.